Although golf had existed in Scotland since the Middle Ages, as a popular game it dates to the end of the nineteenth century. The first North American golf club, founded by a Scot in Montreal in the 1870s, and soon followed by others in Quebec and Ontario, was the outcome of Scottish immigration. The earliest U.S. club was founded in Brookline, Massachusetts, in 1882. From the beginning, the clothing for golf was practical fashion wear, based primarily on the new men's sporting models appearing for use for bicycling or shooting at the time. It consisted of tweed suits with vests and, if knickers were chosen as trousers, knee-high stockings to complete the outfit. For women, who participated from the outset, a nod to practicality appeared in the slight shortening of skirts, some four to six inches off the ground, but dress for golf generally remained the clothing of the New Woman of the turn of the century: skirt, shirtwaist blouse, jacket, hat and gloves, and of course, a corset. The overall effect was conservative but comfortable for the time. It was clothing suitable for women to wear while interacting in public with men. This remained the model well into the 1920s, and indeed, given inevitable changes in design, the general tone for golf wear from that time on. In the 1920s, Edward, Prince of Wales (later Edward VIII and duke of Windsor), influenced golf fashion with his dashing personal style, especially in his choice of traditional Fair Isle patterned knit pullover sweaters and argyle socks. The knickerbockers of the previous century were the preferred trousers at this time, but now were cut four inches longer than the older version, making them baggier at the knee; hence the name, "plus fours." Two-colored shoes and soft-peaked tweed caps completed the look, which became the uniform of choice throughout the 1930s. Even in the early 2000s, knickers, though rare, continue to be worn. Cleated shoes then were often two-toned, much in the style of the saddle shoes that became the signature footwear of bobby-sox teenagers everywhere in the late 1930s. In addition, golf shoes often had a fringed kiltie flap that covered the laces. Bobby Jones, the Tiger Woods of his day and founder of the Masters, codified the fashion set by the Prince of Wales in the United States. Throughout this time, women remained skirted. Tailored sports dresses that were the precursors to the shirtmaker dress emerged in the late 1920s and 1930s; tailored separates alternated with the dresses into the post-World War II years. Skirts were in keeping with the fashions of the time, hovering around the knee in length, usually gored or relaxed with inverted tailored kick pleats front and back to allow movement and ease. They were coupled with tailored shirts and sweaters. Bermuda shorts, the sportswear darlings of the mid-1950s, hitting just above the knee and worn with knee socks, became preferred garments for both men and women at that time and continue to be worn for golf in the first years of the twenty-first century, though women usually wear them with short socks or sockees that come only to the ankle. Shorts and skorts (shorts with a skirt-like flap extending from the side seam three-quarters of the way across the front of the garment to give the appearance of a skirt) are also part of a woman golfer's wardrobe. Professional golfers, both male and female, wear long, loose, comfortable trousers or long shorts, with belt loops and belts. Most golf clubs have a policy of a collared shirt, whether woven or knit. Most frequently, these are polo shirt style. The club name or emblem is traditionally embroidered on the left breast, and it also appears on the baseball caps or sun visors that have been adopted for golf. Most clothes for golf were practical cotton, particularly if worn in warm or moderate climates. Of course, golf fanatics who play as much as they can throughout the year, even in the north, wear layers that keep them warm, with sweaters and zipper-front waterproof jackets. With the introduction of manufactured fibers, notably polyester in the 1960s that spawned the ubiquitous "no care" polyester/cotton fabrics, golf clothes took on a more daring coloration in keeping with the fashions of the 1960s, giving golf clothing the reputation, that continues to linger, of colorful, often garish clothing that makes no attempt to be stylish. Even the greatest sartorial symbol of golf, the highly coveted Master's jacket, is a bright, unforgettable green that few would choose to wear off the links. Overall, golf clothing might be termed fossilized fashion, becoming almost a parody of itself in its adherence to conventional forms. 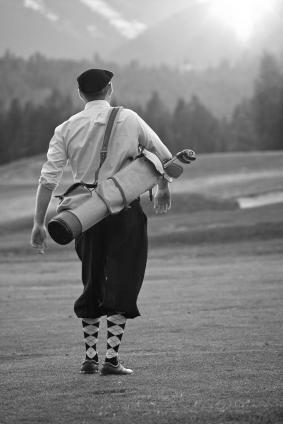 Golfers are stereotypically known to wear clothes that are codified by past traditions rather new fashions. They choose outfits that are practical, loose, and pragmatic in keeping with long outdoor walks that are broken periodically by the need to swing a golf club. Although stars such as Tiger Woods maintain a casual elegance in their golf dress, their choices still fall into the general categories of loose and comfortable. The contrast between dark conservative business suits worn during the workweek and the colorful, loose, and comfortable clothing worn for golf on the weekends has become, at the beginning of the twenty-first century, virtually a cliché. Armitage, John. Man at Play Nine Centuries of Pleasure Making. London and New York: Frederick Warne and Company, Inc., 1977. Chenoune, Farid. History of Men's Fashion. Paris and New York: Flammarion, 1993. Lee-Potter, Charlie. Sportswear in Vogue since 1910. New York: Abbeville Press, 1984. Tortora, Phyllis, and Keith Eubank. Survey of Historic Costume. 3rd ed. New York: Fairchild Publications, 1998.